Joint Base Myer-Henderson Hall Commander Patrick M. Duggan and Command Sgt. 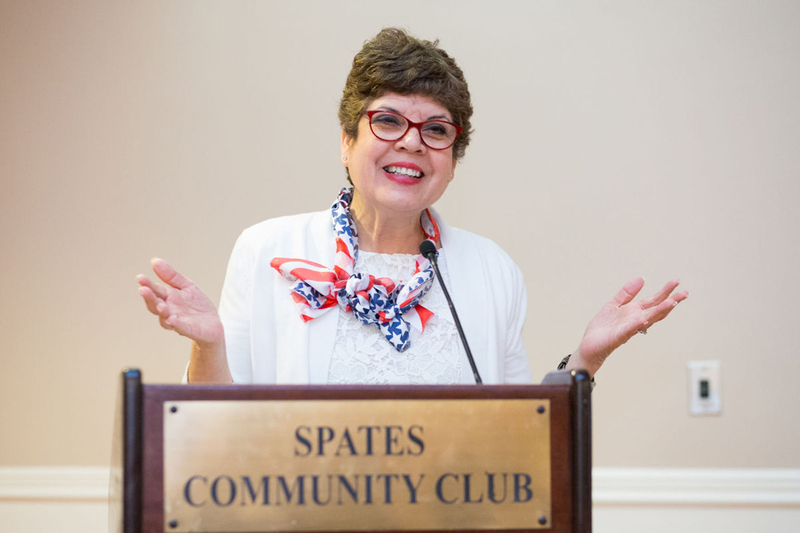 Maj. Carolyn Y. Donaldson honored members of the JBM-HH community who donated their time and service over the past year during the Installation Volunteer Recognition Ceremony at Spates Community Club. “We truly are grateful for everything that you ladies and gentlemen do,” Duggan told the volunteers who collectively contributed 78,000 hours of labor. In her keynote address, Patricia Barron, the Association of the U.S. Army’s director of family readiness, said that the military volunteers she has met over her decades of service share several traits in common. “We have passion, we have a need for balance and we also have pride,” she said. She advised volunteers to balance their enthusiasm for serving others with the need to care for themselves and their families. Above all, she urged volunteers to be proud of the invaluable contributions they make to the military community. Twenty-four volunteers were honored during the ceremony including Rigo Santiago who was awarded a Department of the Army Certificate of Appreciation for 25 years of service. Judy Jagielski and Alba Thompson received the Department of the Army Commander’s Award for Public Service for 20 years of volunteering. Jerrel Catlett and Army Master Sgt. David Parthemore were given the Military District of Washington Helping Hand Award for outstanding service in two or more volunteer organizations. Army Spc. Shawn Kula, Lorraine Thompson, Larry Steele and retired Navy Capt. Gerrish Flynn were recognized as Volunteers of the Year. Other individuals acknowledged during the ceremony include: Frank Bernardo, Helen Bernardo, Alice Butler-Short, David Denniston, Jan Ebeling, Caryl Finnerty, Elaine Freeman, Evelyn Majauskas, retired Army Chief Warrant Officer Bettye Mayes, Michelle Morgan, Mary Nicholson, Carol Offield, Lorraine Thompson, Miriam Towey and Carroll Towey. In addition, recognition was also given to volunteer organizations including: the American Red Cross, Arlington County Chapter at Andrew Rader U.S. Army Health Clinic; the Program for Employment Preparedness; the Army Officers’ Spouses’ Club of the Greater Washington Area; the Fort Myer Thrift Shop; the Armed Forces Hostess Association; and the Army Arlington Ladies. Also honored were: Army Community Service; Fort Myer Chapel Congregations; Fort Myer Fitness Center; Fort Myer Legal Assistance Tax Center; JBM-HH Retiree Council; the Army Ten- Miler; the United Service Organization; 1st Battalion, 3rd U.S. Infantry Regiment (The Old Guard) Family Readiness Groups; and 4th Battalion, 3rd U.S. Infantry Regiment (The Old Guard) Family Readiness Groups. Francis Chung is a staff photojournalist for the Pentagram newspaper, a publication focused on Joint Base Myer-Henderson Hall.